Suffering from chronic tone failure? Just what the doctor ordered! Sign up for our automatic monthly string shipments and receive a 10% discount on your order each month. 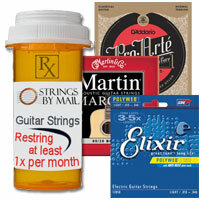 Don't let your tone and touch suffer because you don't have fresh strings on hand. You can also include picks or other products you need on a regular basis. Place this item in your shopping cart along with the products you want us to send each month. * some product exclusions will apply – subscription discount does to not apply to quantity discounts or other promotions. By signing up for the SBM String Subscription Service you authorize Strings By Mail to charge you card for the subscription order on the first business day of each month. You may cancel the service at anytime by phone or email. If your card has expired or is cancelled you will be notified and your service will be ended until new card information is provided. Took part in this service for 6 months and enjoyed it very much! I'm a jazz guitar hobbyist and smiled every time a new set of Thomastik's arrived at my doorstep. It finally gave me a reason to change my strings on a regular basis. All stocked up for now but will continue once the supply runs low. Highly recommend to players of any level!